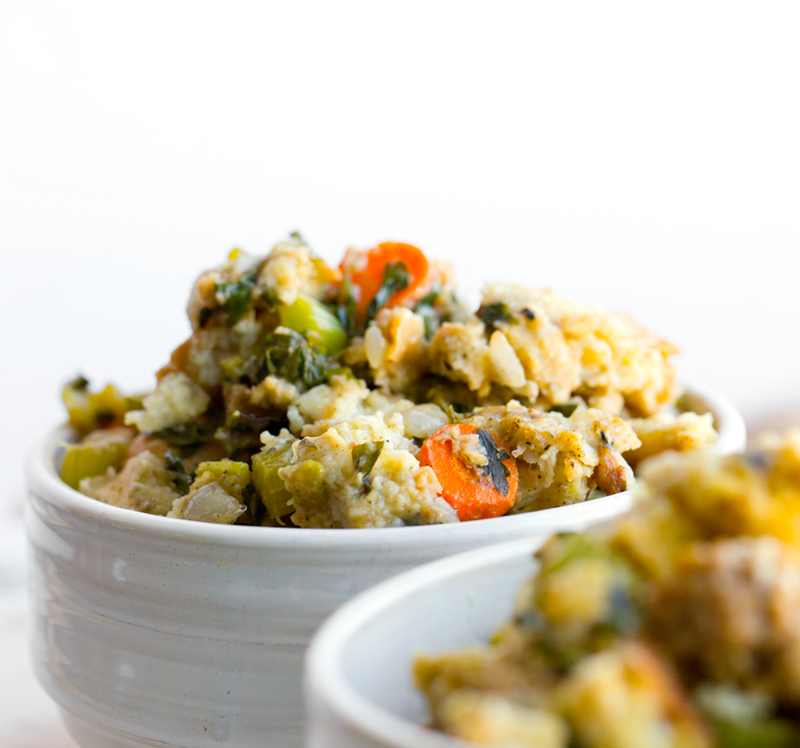 Vegan Stuffing for the Holidays! 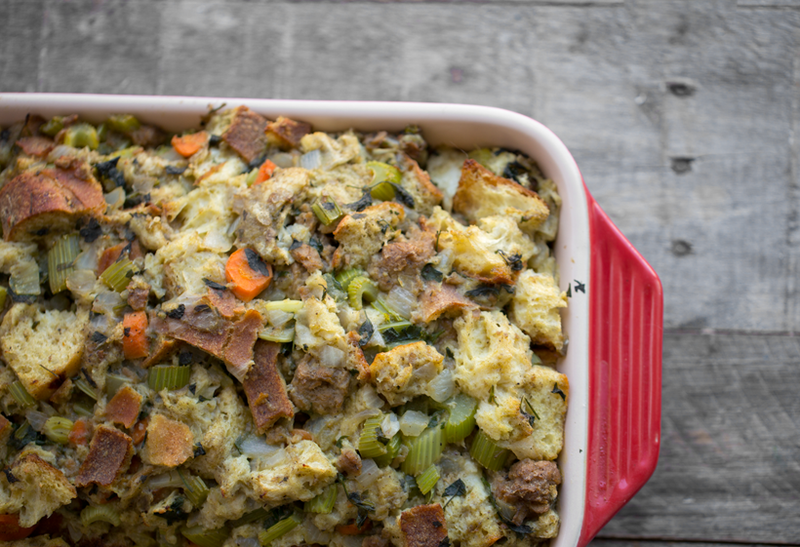 Stuffing was one of those recipes that I always loved as a kid at my family's Thanksgiving table. However, like most budding vegetarians, I wasn't too fond of how the stuffing was prepared. Eventually, my mom started making a side portion of stuffing for me, via just the stovetop. And yes, the best part about stuffing is that you can absolutely make it using just plants, and "stuff it" using a basic casserole dish. 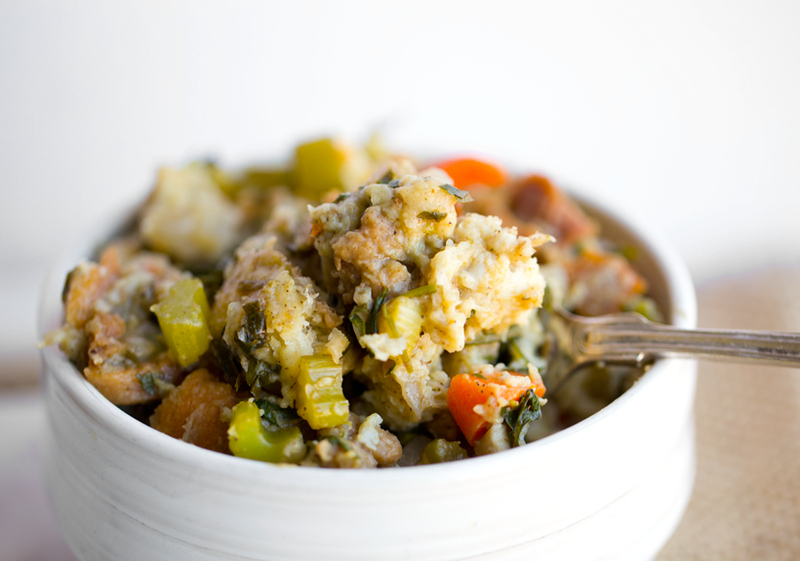 No turkey's harmed in the making of a vegan stuffing! 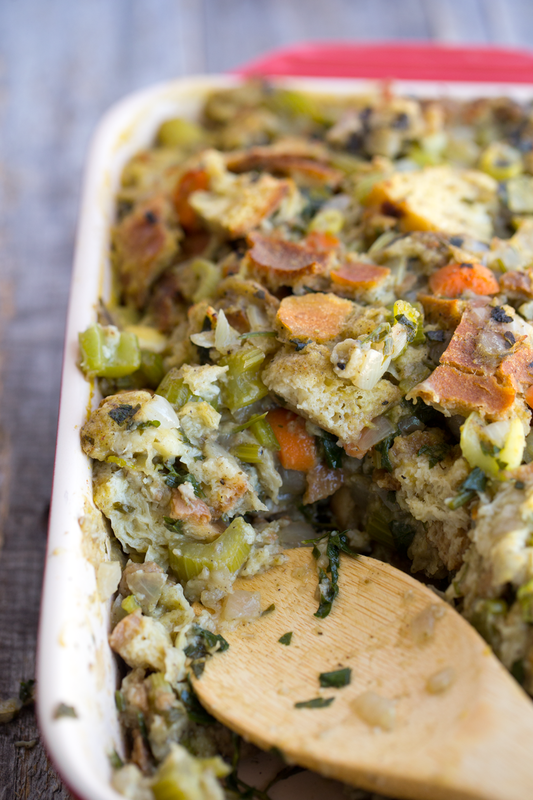 A vegan stuffing recipe is especially important if you are embarking on your very first vegan or vegetarian Thanksgiving. You probably do not want to leave this holiday fave off your menu, but you might be like, well, "Where do I stuff this stuff now??" Easy! I mean, this method is kinda like taking that old school Stovetop Stuffing boxed mix and taking it to a whole new, homemade level, right? ...And yes, Poultry Seasoning is vegan. 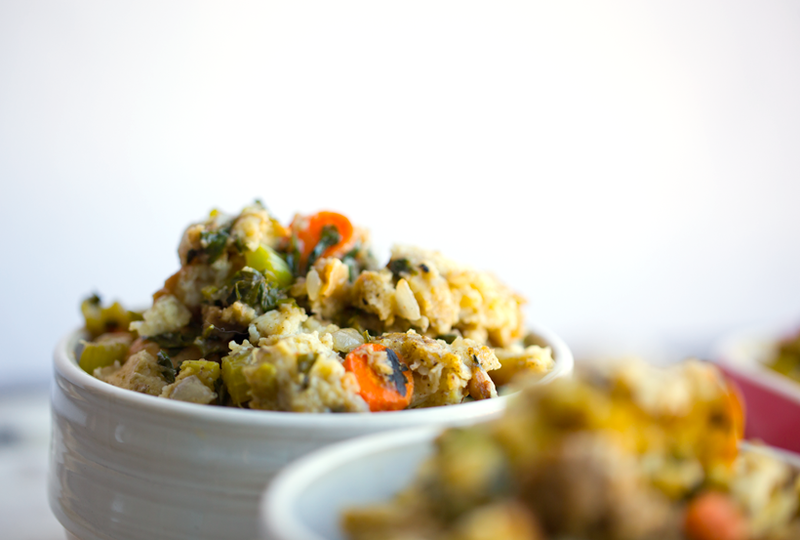 Video: Watch me make this vegan stuffing!.. - other options: corn bread, pita, rolls, french bread... Creativity is ok! My preference is sourdough sandwich bread, day-old, left on the counter for a few days until it dried out. Then you slice off the crusts and slice into cubes. I also like to use crusty bread and just keep the crust on! It works well because once it dried out a bit on the counter, you can easily tear it into pieces. What does day-old bread mean? Day-old doesn't mean the bread has gone "bad" or is moldy. It just means that it is a few days past its fluffy fresh self. Day-old, or "stale," bread is just a bit dry. This allows for easy slicing. 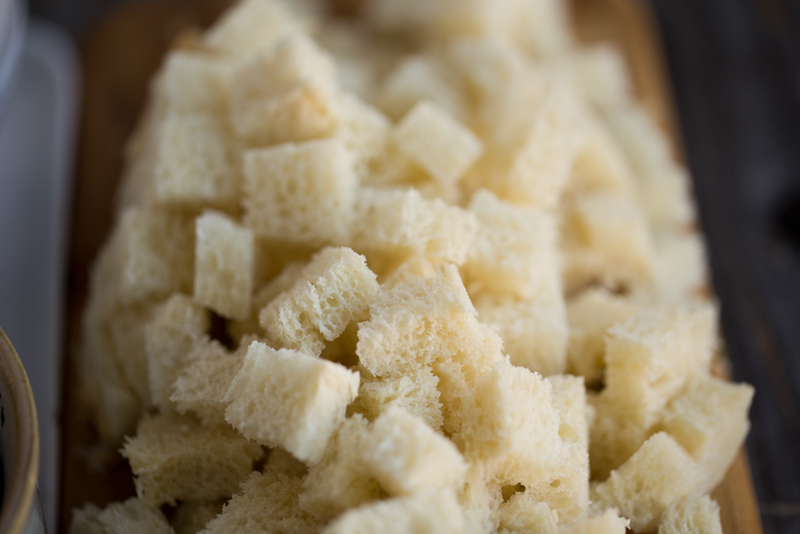 Fresh, soft bread is really challenging to slice into cubes without mushing it down a bit. Fluffy, dry bread cubes are what you want! Stovetop prep, then load it into a casserole dish to cover and bake in the oven until moist and fluffy! Before baking in the oven..
From the oven, your stuffing will be steamy and browned on top. To de-crust or not to de-crust? There are a bunch of dark brown spots in my stuffing from the crusty bread I simply tore up, crusts still on. I do not mind crust at all, though it does add a more textured, hearty essence to your stuffing, and creates a darker array of bread colors. 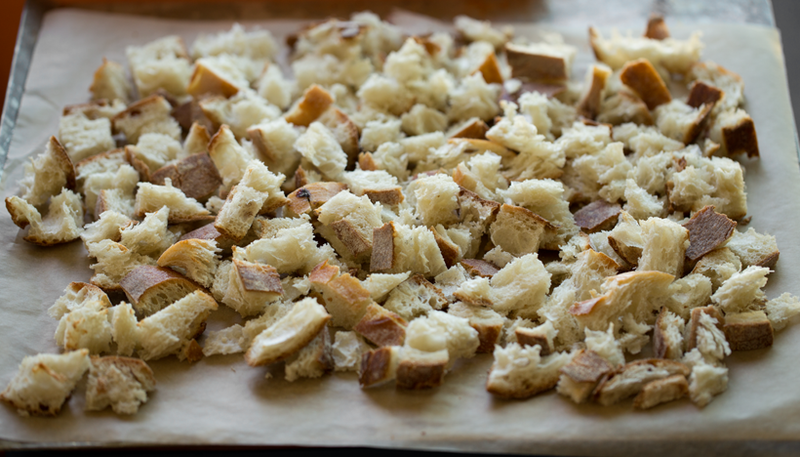 If you want super moist, soft, crust-free cubes and stuffing, de-crust your bread. I love the chunks of carrot, celery mingling with vegan sausage, bread and seasoning, creating so much holiday flavor. Hearty Add-ins? I used vegan sausage in today's stuffing. But if you want to change that out I would sub with either sauteed or roasted mushrooms, or chopped roasted chestnuts and a few extra splashes of broth. Other hearty add-in options: lentils, tempeh, wild rice or even chickpeas! Bring on the Leftovers. Stuffing is so delicious warmed up for lunch the next day. All the flavors marinate overnight, which intensifies the flavors even more! 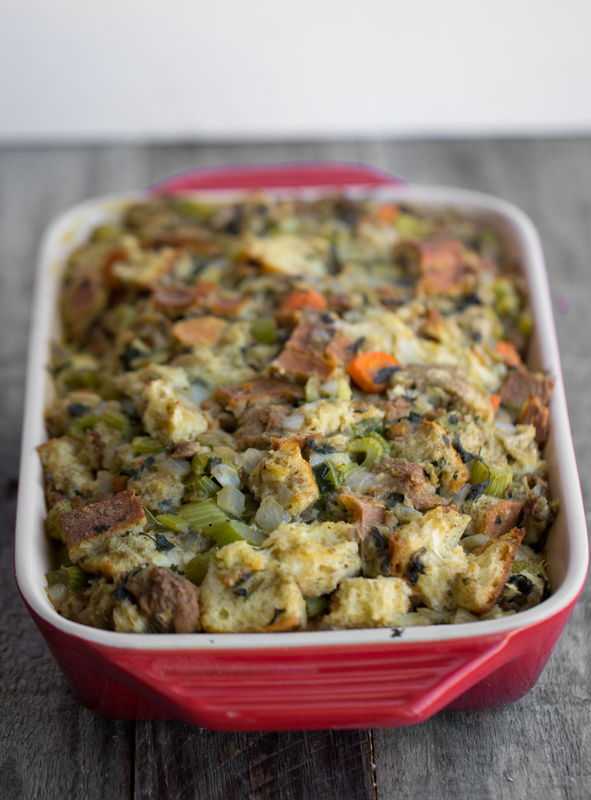 Craving extra-dense, moist stuffing? Add a few extra splashes of broth. Midway through baking in the oven, lift foil and pour some additional broth right over op. Cover again and continue baking. Craving a drier, fluffier, lighter stuffing? Reduce some of the broth, just adding as needed. You can also bake your stuffing a bit longer with the foil covering OFF to dry things out a bit. If you have any prep or cooking questions, let me know in the comments! Happy to help. DIY Poultry Seasoning. If you cannot find a blend, or just want to make your own, you can do so with fresh thyme, sage and rosemary. Those are the most important three spices for stuffing, in my opinion. Pepper is also important. Here is a great DIY poultry seasoning recipe from genius kitchen. 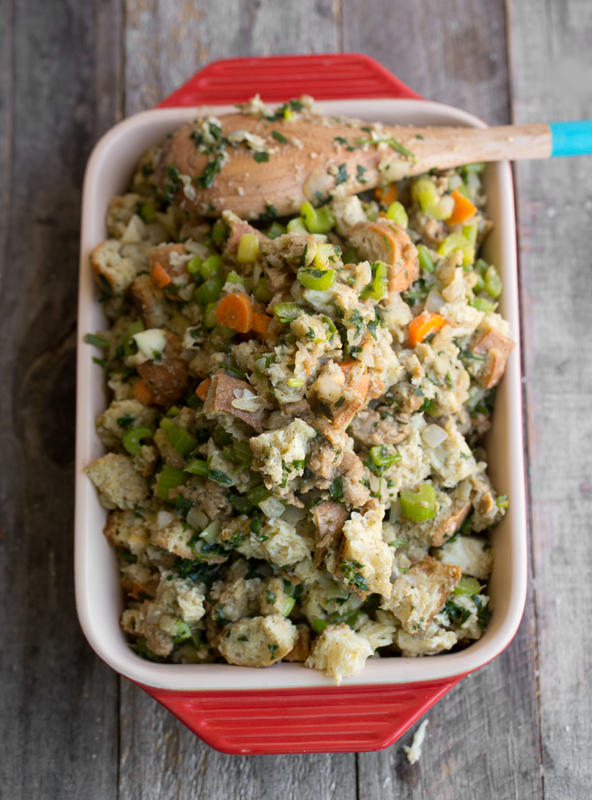 This fluffy and moist stuffing is loaded with classic stuffing flavor, bursting with tender veggies like celery and carrots. Simple to make on your stovetop and oven. Optional vegan sausage adds even more flavor. Prep Tip: If your bread is not 'stale' enough, you can toast it (whole loaf, slices, as torn bits, or sliced cubes) in a 350 oven for about ten minutes to dry them out a bit. Warm a large soup pot over medium heat. Add the vegan butter to melt. Add in the vegan sausage to lightly brown the edges. Then add in the garlic and onion and stir well to combine and lightly cook the onions. When onions soften, add in the celery, parsley and carrot. Add in the poultry seasoning, salt and pepper. Stir well and cook for 2-3 minutes. Then add in 1 cup of the broth and cover with a lid. Reduce heat to low and cook for 3-5 minutes. Lift lid and stir. The ingredients should be cooked down a bit and softer. 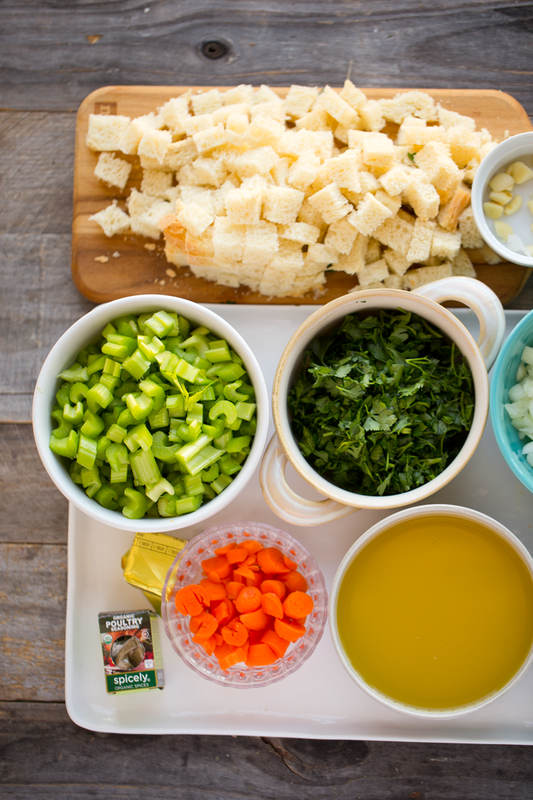 Slowly fold in the bread and broth, alternating by adding in 1-2 cups of bread, tossing with the veggies, adding a splash of broth and repeating until all the bread and broth is added. Cover with lid and cook over low heat for about five minutes. During this time, preheat your oven to 350 degrees. Pour the stuffing into a large casserole dish and flatten down with a spoon. Cover with some foil, tightly, and place in the 350 degree oven to bake for about 20-25 minutes. 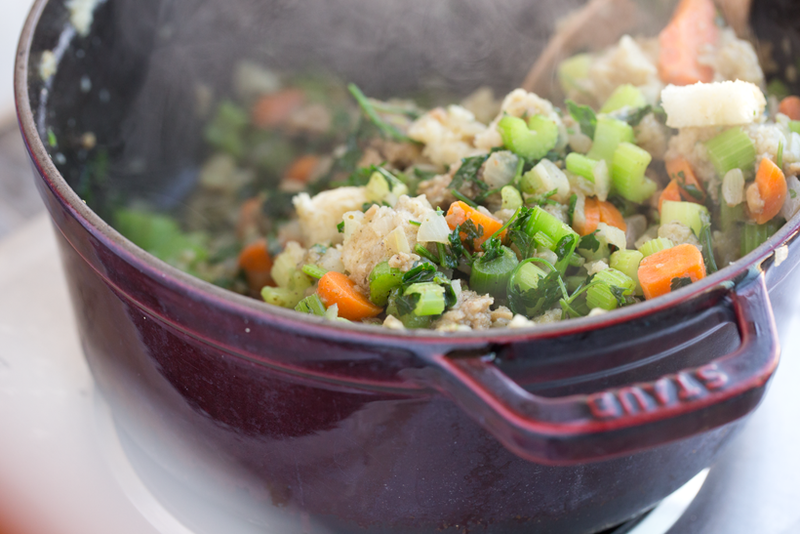 Tip: If you think your stuffing looks a bit dry, you can pour some extra broth over top before covering with foil. For the last 5 minutes of baking, remove the foil. This will help brown the top and give the top layer a nice crispness to it. Serve warm! Delicious as leftover too.